To me, the 1980 Ford Thunderbird was one of those “why?” cars, though the competitive drivers were obvious. The third Ford based on the “Fox” platform (the Fairmont and the Mustang had come first), the eighth generation ‘bird was of one of the most radically downsized automobiles in the North American auto industry. In comparison to its 1979 predecessor, the base 1980 Thunderbird was 17 inches shorter and 900 pounds lighter. Standard power for 1980 was a Windsor 118 bhp 4.2 liter/255 ci V8 with a Motorcraft two-barrel carburetor paired with a SelectShift three-speed automatic transmission. Powertrain upgrades were available: buyers could specify a $150 131 bhp 4.9 liter/302 ci V8 with a two-barrel carburetor and could then add a $133 automatic overdrive transmission (with that engine only). With the standard powertrain, 0-60 took about 15 seconds in the 3,100-pound car—the best powertrain combination dropped that time to a far more respectable 12 seconds. Mileage was 18 city/26 highway by the standards of the day—with a 17.5-gallon gas tank, a Thunderbird owner could expect a range of about 345 miles with a 10% fuel reserve. Standard exterior and mechanical equipment on the $6,816 base Thunderbird (about $22,400 in today’s dollars) included variable ratio power rack-and-pinion steering, power brakes, Thunderbird hood ornament with color-coordinated insert, full wheel covers, and P185/75R x 14 black sidewall tires. Inside, a tweed cloth-and-vinyl Flight Bench seat, a day/night inside mirror, an electric clock, and an AM radio were all standard. Moving up to the $10,424 Town Landau (approximately $34,200 now) added a lot of equipment, including cast aluminum wheels, dual remote control mirrors, interval windshield wipers, velour cloth split front bench seat, six-way power driver’s seat, SelectAire air conditioning, power windows, power lock group, tilt steering wheel, and an AM/FM stereo radio. The top of the line Silver Anniversary edition ($12,172 then, $39,900 now) added the 4.9 liter engine, the automatic overdrive transmission, Keyless Entry System, a patterned luxury cloth split front bench seat, leather-wrapped steering wheel, fingertip speed control, a power antenna, and turbine-spoke cast aluminum wheels. Options included a power-operated moonroof ($219), electronic information cluster ($275-$313), and leather upholstery ($349). 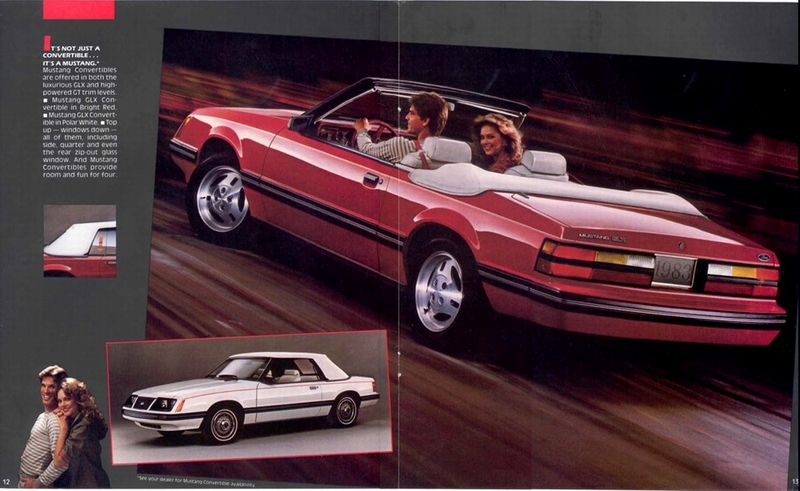 Two pages from the 1980 Ford Thunderbird brochure, linked from the Old Car Manual Project’s amazing brochures section. 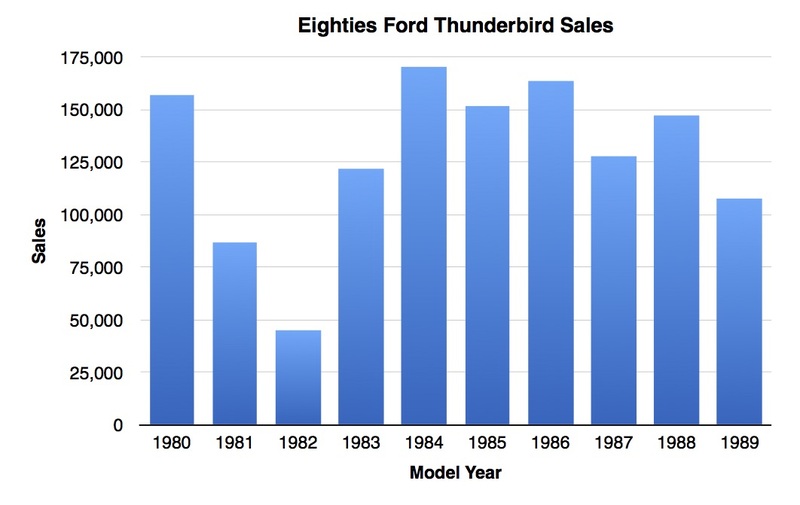 To say the market was not ready for the 1980 Thunderbird is a distinct understatement. Despite a much better level of standard equipment, the Thunderbird was only five inches longer than the plebian Fairmont. Sales of Ford’s halo model collapsed: dropping from 284,141 in 1979 to 156,803 in 1980, and losing almost a full percentage point of sales during a year when none of the main General Motors competitors in the personal luxury coupe market had more than a facelift. It would get worse in the following two years: 86,693 in 1981 and 45,142 in 1982. 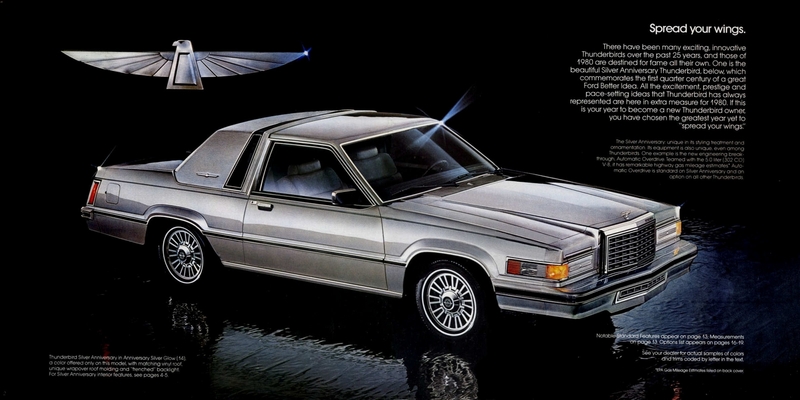 By 1982, the Thunderbird was being handily outsold by all four of the mid-size GM coupes: Buick Regal, Chevrolet Monte Carlo, Oldsmobile Cutlass, and Pontiac Grand Prix. It would take the next Thunderbird design in 1983 to redress this balance. According to Hagerty’s valuation tools, all the money for a 1980 Thunderbird Silver Anniversary in #1/Concours condition is $13,400, with a far more typical #3/Good car going for $5,000. This generation of Thunderbirds maintains some presence in the Hemming’s Motor News classifieds and on eBay Motors. As I write this in November 2017, there’s a black/silver two-tone 1980 with 85,000 miles for sale in Germany. The price: $12,800. 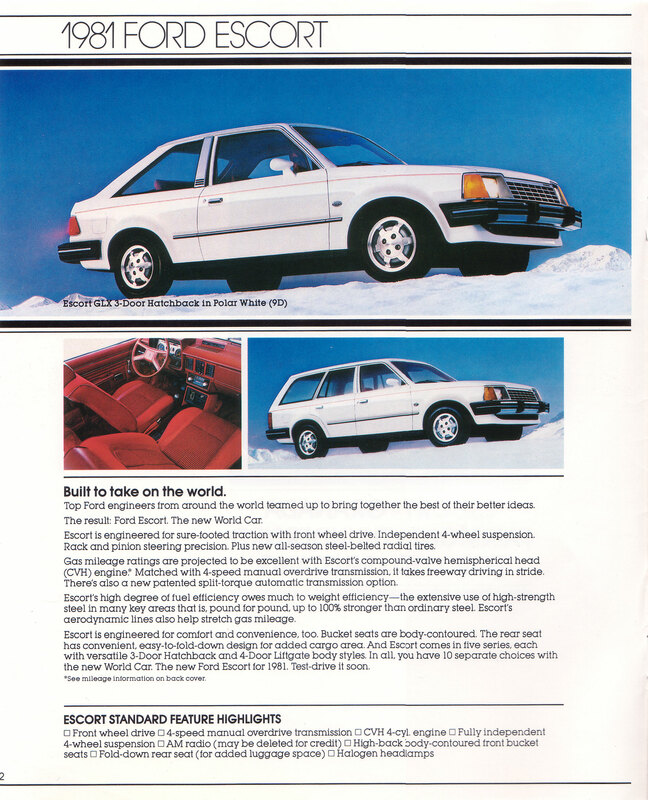 Late in the 1984 model year, Ford added a performance-oriented model to the Fairmont-based LTD line. The LX was loosely based on a few sedans that Bob Bondurant had cobbled together for use at his high-performance driving school. The engine was Ford’s 165 bhp 4.9 liter/302 ci Windsor V8 with electronic fuel injection. The only transmission available was a four-speed automatic transmission. 0-60 came in a respectable 9 seconds—faster than the Dodge 600ES and competitive with the Pontiac 6000 STE. Mileage was 19 city/23 highway by the standards of the day (17/22 by today’s standards). With a 16-gallon fuel tank, range was between 280 and 300 miles with a 10% reserve. For 1985, the LX wore the updated nose and tail that came along with all 1985 LTDs. Standard exterior and mechanical equipment in the $11,421 LX (about $26,500 in 2016 dollars) included quad rectangular halogen headlamps, power brakes, a Traction-Lok rear axle, a rear stabilizer bar, and P205/70HR Goodyear Eagle tires (a size still readily available) on 14-inch styled road wheels. Inside, dual power mirrors, lumbar-support bucket seats, a center console with a floor shifter for the transmission, brushed aluminum trim on the dash bezels, an upgraded instrument cluster with tachometer, a Tripminder computer, and an AM radio with dual front speakers (ah, the glamor!) were included. Options included cast aluminum wheels ($224), air conditioning ($743), power windows ($272), power locks ($213), and an electronic AM/FM stereo radio with cassette ($409). Page from the 1985 LTD brochure, linked from the Old Car Manual Project’s amazing brochure pages. Like some other interesting Ford performance cars from the 1980s (I’m thinking of you, Mustang SVO), LTD LX‘s did not sell well, with only 3,260 sold over the 1984 and 1985 model years (there would be no 1986 LX). Likely because of the limited production numbers, you rarely see them in the Hemmings Motor News classifieds or on eBay Motors. There is some enthusiast support. Make mine Medium Charcoal Metallic, please. Yesterday’s Hemmings Daily blog had an entry on the Mustang SVO, titled “Was this America’s most misunderstood sports car?” I’ve updated one of my early posts to reflect both changes in my posting style and substantial improvements in available data. 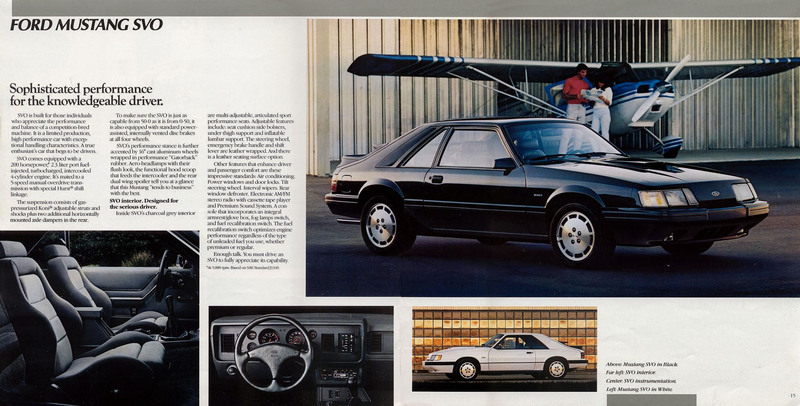 With the announcement of the 2015 Mustang and its available EcoBoost turbocharged inline four, my mind turned back to the 1984 to 1986 Mustang SVO. Created by Ford’s Special Vehicle Operations department, the SVO was an admirable attempt to take a different and more advanced approach to the pony car market. This version of the Fox-body Mustang was built around the Lima turbocharged and fuel injected 2.3 liter/140 ci inline four making 175 bhp paired with a Borg-Warner T5 five-speed manual. By the standards of the day, this combination yielded a reasonable 19 city/26 highway (it would be 17/24 by current standards) and a respectable 7.5 second 0-60 time. Other modifications over the standard Mustang included ventilated four-wheel power disc brakes (replacing the Mustang GT’s front disc/rear drum setup), and a Koni suspension system featuring adjustable struts and shocks. 16 × 7 inch aluminum wheels with 225/50VR16 Goodyear NCT tires (a size still readily available) were standard for the first year—Gatorbacks didn’t become available until 1985. You could have the interior in any color you wanted as long as that was Charcoal, but you did get to choose from the standard cloth or optional leather seats. Standard features included adjustable sport seats with lumbar support and a leather-wrapped tilt steering wheel. Air conditioning ($743), a cassette player ($222), power door locks ($177), and power windows ($198) all remained optional—this was 1984, after all. The exterior featured an SVO-specific front grille, a hood with a functional scoop, and a “dual wing” spoiler that was also unique to the SVO. Mustang SVO page from the 1984 Mustang brochure, linked from the Old Car Manual Project’s amazing brochures section. The average Mustang buyer was happier with a Mustang GT, which, with a base price of $9,578, cost substantially less. The potential buyer of a vehicle with turbocharged and intercooled four, four-wheel disc brakes, and an adjustable suspension wasn’t looking to Ford for this car. 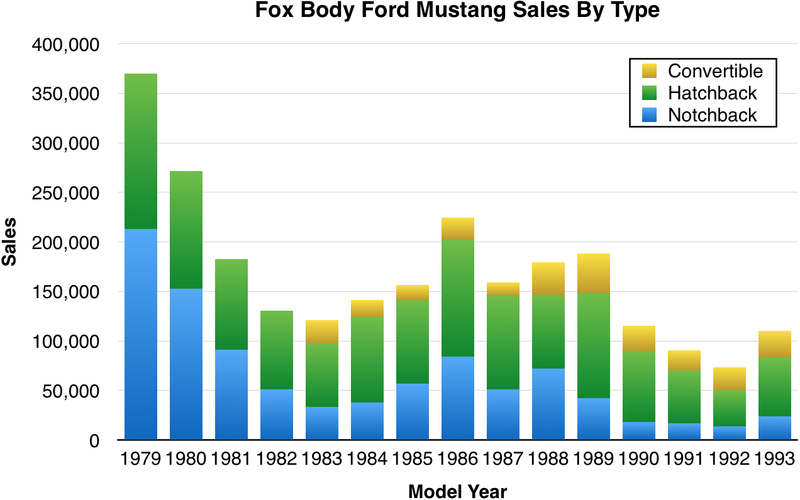 It is interesting to note that Ford was much more successful in the 1990s and 2000s in selling high-end Mustangs. They’ve also done decently with the 2.3 liter (there’s a coincidence!) 310 bhp EcoBoost turbocharged inline four which first became available in 2015. According to Hagerty’s valuation tools, all the money for a 1984 Mustang SVO in #1/Concours condition is $21,900, with a more normal #3/Good car going for $10,100. Make my SVO Silver Metallic, please.